To add billable time to jobs. To mark jobs need be invoiced. To mark/ view jobs already invoiced. To view job details of current running jobs. To add billable time out of total worked time in jobs. This option is available for Managers and Admin users of the system. Step 3: Select the job you need to add billable time. Step 5: Click on icon in front of the task you wish to add the billable time. 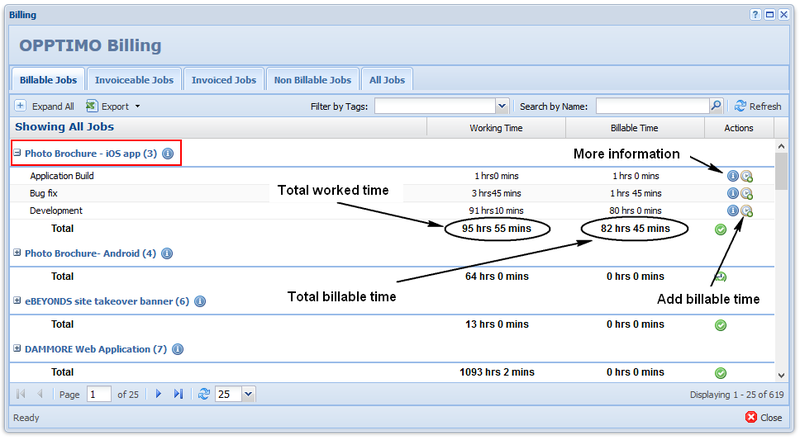 Enter the billable time in hours & minutes in “Add Billable Time” window. 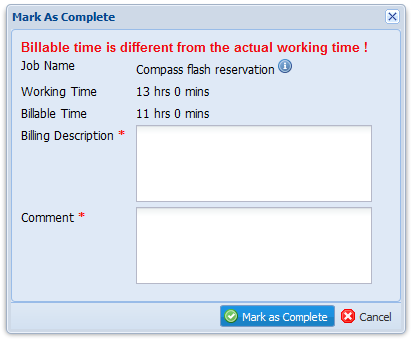 This function facilitate to view each person who worked on the selected task with total worked time. 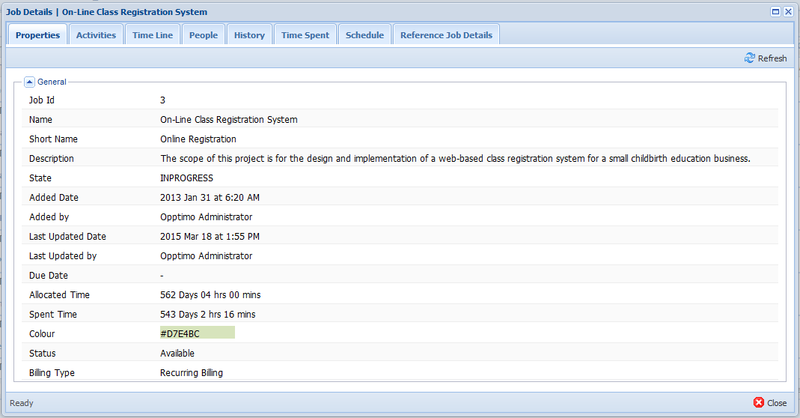 Step 3: Click "More Information" icon infront of the task selected to open below Job task details breakdown window. Step 2: Select the job need to be send for invoicing. Step 3: Click on icon to prompt “Mark As Ready Bill” window. Enter description required for billing in [Billing Description] text area and type any comment/ comment in [Comment] text area. If the billing time and working time is different, system will display a message of “Billable time is different from the actual working time!” in “Mark As Ready Bill” prompt window as below. Step 4: Click on button to save the record. Provide the facility to view the billing history of jobs. This function is applicable ONLY for recurrent billing jobs. Step 2: Select the job you need to view billing history. Step 3: Click on to prompt the “Job Billing History” window. Times are listed according to tasks. You can navigate through the date by clicking on left & right arrows of option. Step 2: Click on tab in “Billing” window. 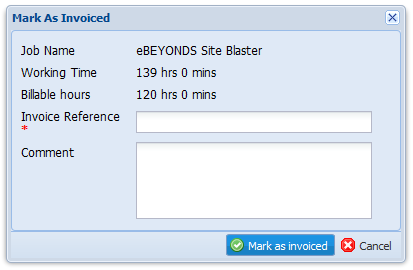 This will list all jobs that billing times are added but not invoiced yet. Step 3: To view job billing details, click on “More Details” icon. This will prompt “Job Billing Details” window. Step 2: Click on tab in “Billing” window. Step 3: Select the job you need to mark as invoiced. Click on “Mark As Invoiced” icon. Step 4: Enter invoice reference number and comments in the “Mark As Invoiced” window. *Invoice Reference number is mandatory. Step 5: Click on button to save the record. Step 2: Click on tab in “Billing” window. This will list all invoiced jobs. You can sort the records using table headers. To export all invoiced jobs, click on option. To refresh the table records, click on option. Step 2: Click on tab in “Billing” window. This will list all current running jobs as below. You can sort the records using table headers. Step 3: Select the job you need to view details. Click on “Job Details” icon to prompt the “Job Details” window.